The holiday season is here, and so are the holiday marketing campaigns. And thanks to social media and some creative online applications, companies now have many ways to engage customers with a holiday theme. Here is a list of holiday marketing campaigns for ecommerce and brand sites. All of these campaigns use social media. Several sites also use contests and creative website applications to engage customers with the holiday message. In a blog post at the end of October, Target unveiled the theme for its holiday marketing campaign: #MyKindOfHoliday. The hashtag encourages guests to join the conversation through social media platforms about their own unique traditions. The post also promises weekly Instagram challenges, how-to photos and videos to inspire creative gift giving, and last minute shopping tips on Twitter. Target has also teamed up with event producer David Stark for a party planning resource on Pinterest called Best.Party.Ever. It offers inspiration for party themes, tips and product recommendations. Select guests will have a chance to have David Stark and his team curate personalized Pinterest boards based on individual needs and aesthetics. 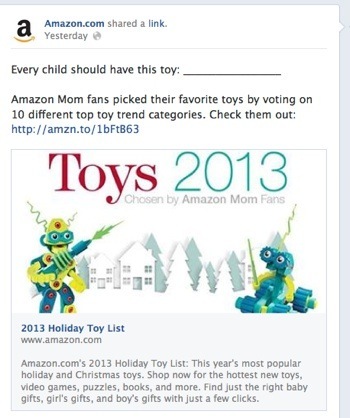 Amazon is promoting the holiday season with its 2013 Holiday Toy List, chosen by Amazon Mom fans on Facebook. The list has its own forum with over 300 discussion topics. Amazon is also promoting its Black Friday Deals Week with the hashtag #BlackFriday. Users can access the holiday promotions in Amazon’s Holiday Central section. Holiday Toy List on Facebook. Fashion retailer Topshop is running a “Dear Topshop” holiday campaign. 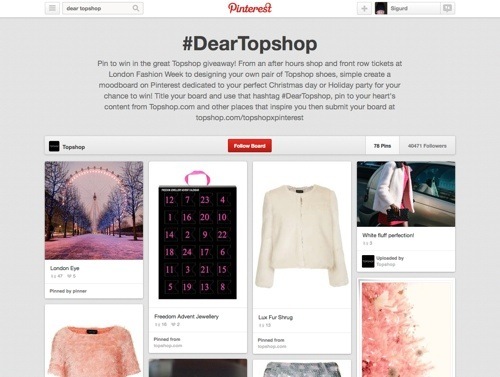 Along with its Dear Topshop interactive gift guide, Topshop is running a contest on Pinterest. Simply create a board with the hashtag #DearTopshop that’s dedicated to your Christmas day or Holiday party. Pin content from Topshop.com and other places that inspire you, and then submit your board. Prizes include shopping sprees and tickets to a Fashion Week show. 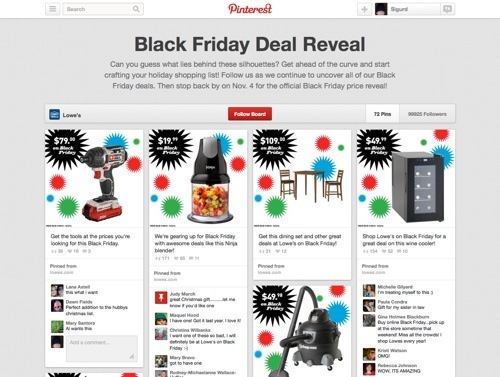 Lowe’s is using Pinterest to run a creative campaign for Black Friday. Silhouetted products cover the board. Followers are asked to guess the items, as well as follow the board as deals are revealed. Black Friday Deal Reveal on Pinterest. Macy’s has launched a Macy’s Believe holiday campaign with an app on its website for children to write to Santa. For every letter it receives at its Santa letterboxes, it will donate $1 to Make-A-Wish. The campaign is promoted with the hashtag #macysbelieve. Toys R Us is promoting its holiday efforts with the hashtag #WishinAccomplished. The company’s website features a holiday Wish Finder gift guide that can browse by age, interest or gender. 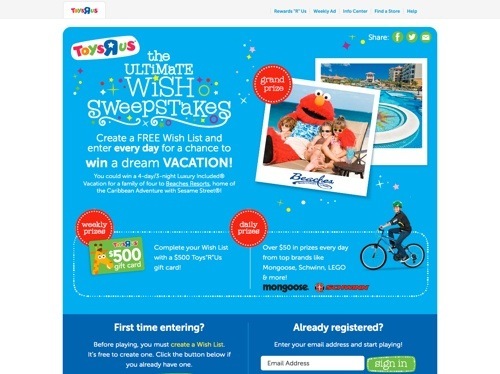 There is also a Wish List creator for children, with an Ultimate Wish Sweepstakes through November 23. Farfetch, a network of more than 290 for independent luxury boutiques, has launched a It’s a Wonderful Store holiday campaign, featuring five weeks of festive shopping with guest curators. 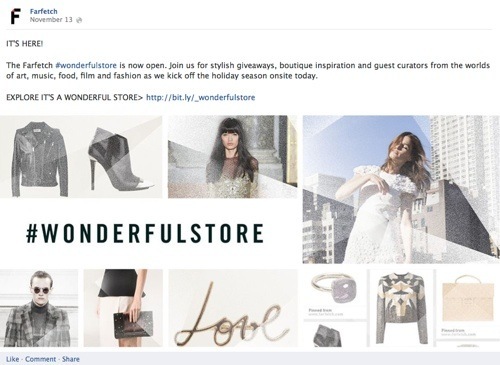 The campaign, which uses the hashtag #wonderfulstore, will include an interactive It’s a Wonderful Store app on Facebook and the Farfetch website where followers can win a different prize every day. 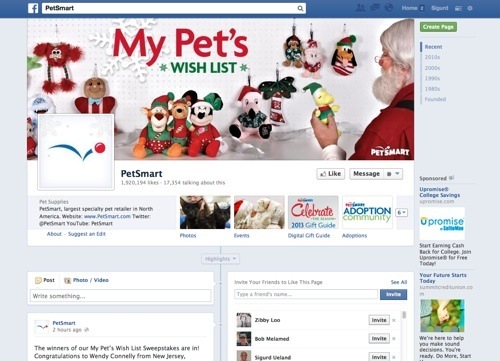 PetSmart has run a My Pet’s Wish List Sweepstakes through Facebook. Fans have voted on their favorite holiday gifts for a chance to win a $300 PetSmart gift card. Ghiradelli’s holiday efforts center around a ’Tis the Season for Squaring campaign for its chocolate squares, including the seasonal peppermint bark. Its site features apps to make a card and receive a coupon, prepare holiday recipes and crafts featuring its holiday peppermint bark. A coupon can be found on its Facebook page. 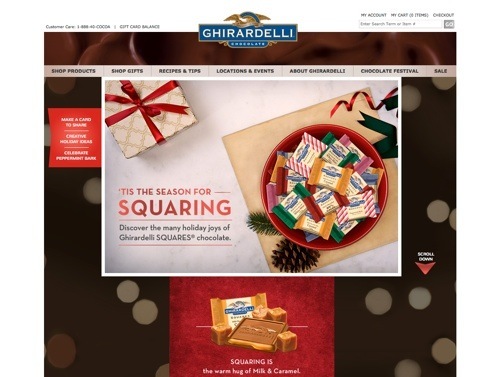 Ghirardelli has also teamed up with Better Homes and Gardens for a “Holiday Baking and Sweet Treats” party on Pinterest.